The 2007 Jeanneau Prestige 36 motor boat is a smart choice for those wishing to experience a new sense of freedom in style and comfort. 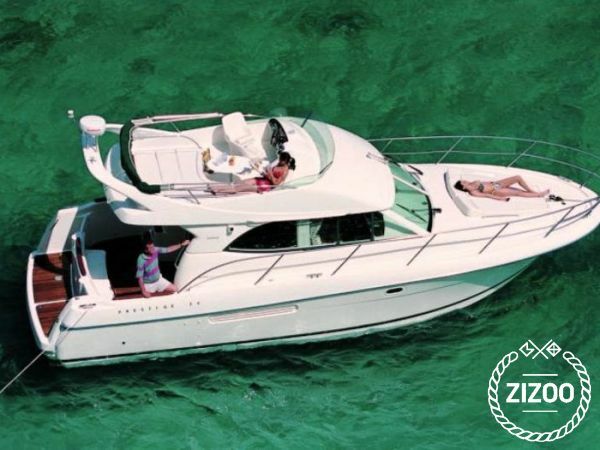 Jump aboard this Jeanneau Prestige 36 in Split and get ready for a high-speed adventure at sea with your friends and family. The Jeanneau Prestige 36 accommodates up to 5 guests and is perfect for exploring secluded coves and beaches in Croatia. The Jeanneau Prestige 36 is located in Split ACI Marina (Split), Split, a convenient base to start exploring Split on a chartered motor boat. Learn more about the Jeanneau Prestige 36 motor boat below. iznajmili smo brod za obic malo otoke. Posto nitko od nas nema dozvolu za brod dobili smo i skipera. On je bio jako ljubazan i od pomoci i odlicno smo se proveli. Buking smo napravili preko agencije zizoo. Mit einigen Freunden haben wir uns im Sommer einen kleinen Luxustörn gegönnt. Dafür war die Yacht genau die richtige Sehr komfortabel und stilvoll. Auch die Abstimmung mit Skipper und Charter lief super leicht.